I am doing a lot of scent consultations lately and it is always very inspiring. It gives me a reason to stay in and smell things and google fragrances for hours, which is of course amazing. It is also a very inspiring challenge to tune into people in the right way so I can really feel their vibe right. But one of the best parts is that through their descriptions of their preferences and sensory references clients give me the most amazing creative images and worlds. I really love reading or listening to someone sharing their ideas with me when they describe what sounds, textures etc they like… And just the other day, as a result of posting the image below on Instagram I found myself in a conversation and scent quest that is just too good not to share. 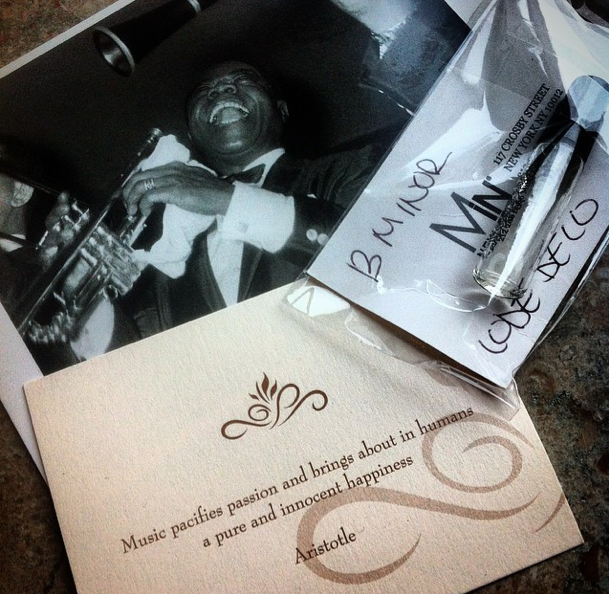 The photo of a sample of a Code Deco perfume evolved into a conversation about musical elements translated into scent notes. (You know I love this topic…) I have promised to find a perfume that is the scent format of a musical description a person (Hi Jimmy!) gave me. I will definitely enjoy doing this… But I thought maybe some of you would enjoy joining me? Here are the clues (amazing brief huh? ): classical, jazz, Moonlight Sonata and Fur Elise and Pathetique by Beethoven, Mozart Amadeus. Violin, piano, cello. Abraham Laboriel & Justo Almario. Bobby McFerrin. Mali Music, extremely high pitches, low base notes, Andrea Bocelli. Peace, sunlight, a plane in the sky. A soft caress of silk on fresh skin after a shower. Emerging after holding breath under water. Green hills, blue skies, colors. Playful but soft and slow. Turqoise and aquamarine. A forest, whispering wind, streaks of light, forest sounds. What do you think…? Any notes come to mind? Or specific fragrances? The scent is “B Minor” from Code Deco, an artisanal perfumery in Singapore. I discovered it through beloved MiN New York’s excellent member’s club. B Minor has a top of dry gin, bergamot and white grapefruit. Middle notes are cardamon, clove buds and a white flower accord. Base is Haitian vetiver, amber and musk and something Code Deco call Jazz Base. It has been marketed as a masculine fragrance but for the sake of freedom of creative exploration (and consultation research) I am not too bothered about that.